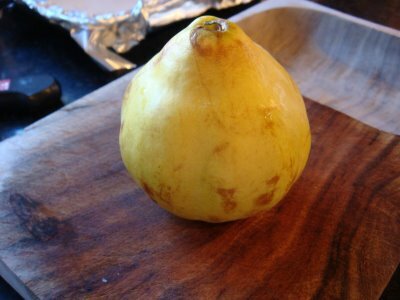 The pineapple quince… exotic and fragrant but inedible when raw. When I bought it at Russo’s last week I thought for sure it would taste fine raw because it smelled so good. All the books warned me, but who were they to know anyway? I just had to taste this thing for myself. 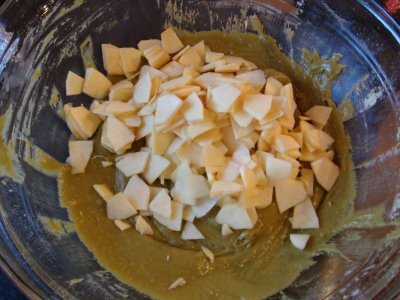 I cut it in half… it looked like a pear and smelled very fruity and sweet… definitely reminiscent of a pineapple. I sliced off a sliver, popped it into my mouth and…. VERY DRY. The experts call it “astringent”. If you have ever tasted an apple that wasn’t ripe you’ll know what I am talking about. The flesh has next to no juice in it. It’s dry and leaves your mouth folding-in upon itself. The flavor wasn’t awful though… but it definitely couldn’t be eaten raw. Okay… so the books were right. Great… now what am I going to do with this thing??? 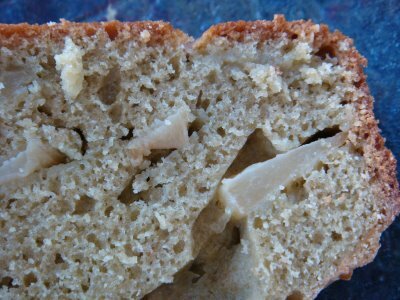 There aren’t too many baked goods that call for only ONE quince. It’s not like you could make a pie, a tart or jelly… (which an online recipe search proved were the three most popular things to do), with just one quince. So I started tearing my pantry apart… trying to find something, anything, I could do with this curious fruit. 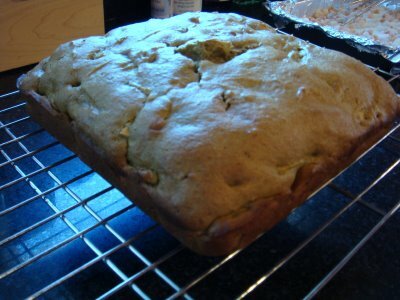 Low and behold, I remembered a box of “Matcha Green Tea” cake and baking mix I had purchased at Trader Joe’s. 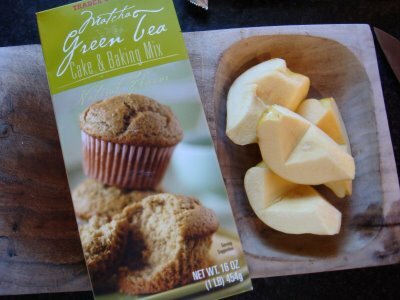 Hmmm… green tea is Asian and quinces are Asian… perhaps they would taste okay together? It was good enough reasoning for me. 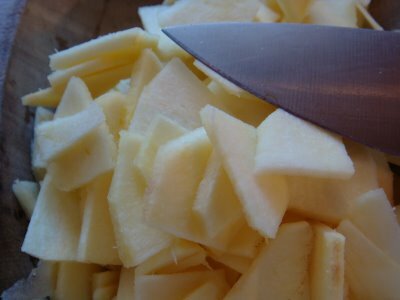 I sliced the quince into very thin, small pieces. I had no idea what the cooked product would be like, so I didn’t want to take any chances with leaving the chunks too thick or big. I made the cake mix according to the directions on the box and then carefully folded in the sliced quince. I wasn’t sure how long to bake it since the box directions didn’t account for the addition of fruit. The box said 35 to 45 minutes. I started checking it after 30 minutes and it was a good 45-50 minutes before the toothpick came out clean. The cake rose nicely and seemed to have a light brown crust on it. I sliced the bad boy up, took a taste and…. yum! The green tea flavoring did not overpower the fruit (which is what I was afraid would happen). 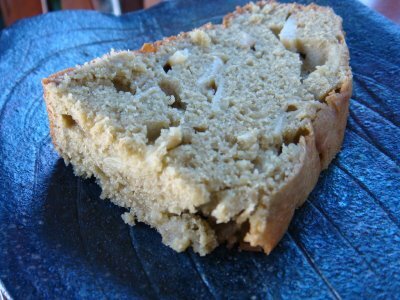 The bread was moist, tender and very fragrant. The fruit cooked up nicely and was also very tender. If I was blindfolded, I wouldn’t know what fruit it was… I would have guessed either apple or pear, but it doesn’t taste exactly like either of those. It’s both sweet and a little bit tart… maybe a little bit like cooked pineapple. It’s good. I liked it and would love to try making something else — but with more fruit next time. 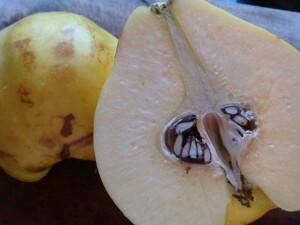 Here is a close up shot… you can see the slices of quince better in this photo.